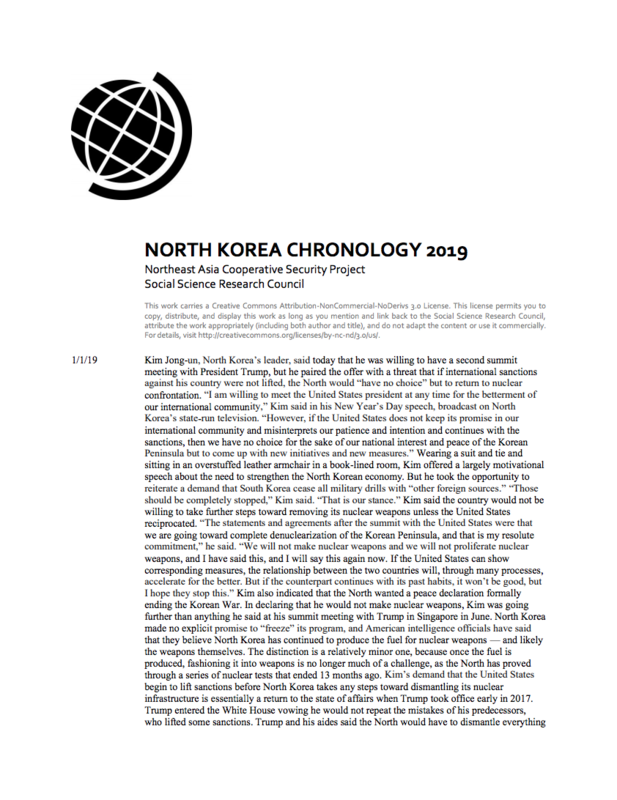 With support from the Carnegie Corporation, the Korea Foundation, and the Ploughshares Fund, the Northeast Asia Cooperative Security Project at the Social Science Research Council has compiled a chronology of events relevant to North Korea’s nuclear and missile programs and negotiations with North Korea. Whenever possible, the chronologies list the date when events happened, not when they were reported in the news media. Any use of this information should cite the Northeast Asia Cooperative Security Project, North Korea Chronology. Questions or comments should be sent to sigal@ssrc.org. To search within the chronologies, open the PDF file and enter Control + F (PC) or Command + F (Mac). "Misplaying North Korea and Losing Friends and Influence in Northeast Asia"
"Bluff and Bluster Never are Effective with North Korea"
"North Korea Is No Iraq: Pyongyang's Negotiating Strategy"
"North Korea, South Korea, and the United States: Reading between the lines of the Chenoan attack"
"Can Washington and Seoul Try Dealing With Pyongyang For a Change?"